But now we’ve moved past the point of crude social lead digging to a much more elegant phase in which prospective clients can be discovered, scored and nurtured using social networks and everyday relationship building tools. As services such as LinkedIn, Facebook and Twitter grow in importance so too have the tools that mine the rich set of sales data left in every interaction. But, the big breakthrough in social selling occurred, in my opinion, when tools that mined social data started talking to each other. No longer do we need the mammoth do everything in one enterprise type tools to compete. A lone salesperson with a Hootsuite and Nimble account and about $20 a month can become a social lead targeting ninja. Now, I’m not saying that some of those more expensive and more complicated tools aren’t awesome. Heck, if you’ve got the budget, full-time IT support and someone to pull the levers and adjust the mirrors, go for it! But, if that’s not you, let me ask you this. Would it be helpful if you could easily find people searching for your products on, say, Twitter? Okay, no magic there, anybody with a little Twitter search mojo has been able to do that for years now, but . . .
What if you could also instantly know everything those people are doing on other social networks? Who they are, who they are connected to and how to contact them in several channels? What if you could easily create a contact record that unified all of your communication with them? What if you could then start to track what they did on your website and how they reacted to your emails? First off, you can easily do all of this and more with little or no tech support for less than $100 a month. Do you think that could make you a better sales person? I’ve only mentioned Twitter so far, but you can do the same kind of discovery and targeting on Facebook, LinkedIn and Google+ as well with the right tool set up and integration. And building targeted lists is only one way to look at what I’m talking about. You can also build a connected network of your customers, share targeted insights and facilitate engagement and partnerships better when you adopt this kind of targeting mindset. Here I’ve used Hootsuite to find someone on Twitter that I want to connect with, so with one click I’ll add them to Nimble for a complete picture and connection record for future engagement. The key piece of the puzzle is integration. Hootsuite is a great tool, but integrated with Nimble, it’s a power tool. I can easily build a list in Twitter based on search criteria and then with one click add selected list members to the Nimble CRM tool for a complete picture of the prospect along with unified messaging. 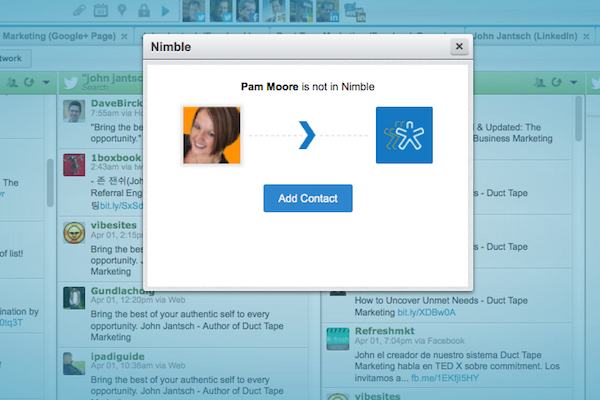 So, now if I reach out to that prospect by way of a subtle connection tweet, Nimble captures our entire conversation, shows me the prospect’s social stream and their key connections in one screen. As much as I’ve grown to appreciate the power of a true social CRM tool, integrating it with a lead tracking and capture tool like Hubspot further allows me to score the interest of my leads and keep an entire record, not only of my direct interactions, but also their interactions with my content and landing pages. Integration is also what allows most CRM tools to talk to most email service providers. I’ve written previously about a specialty service called Zapier that allows you to create your own integrations where none exists. For example, you might want to create special record in Nimble when someone buys something through your 3rd party shopping cart – no problem, create a Zapier integration and get busy with better follow-up. Social is not so much a channel as it is a behavior that allows for much richer listening, targeting, nurturing, learning and converting. The key is to bake social data and signals into your entire prospecting and sales process as a mindset using tools that put this vital set of data at your fingertips. The real skill then becomes using this information to add value! I’ve added a list of CRM tools and hope you’ll share your thoughts and insights.